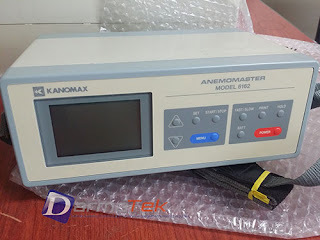 The Kanomax 6162 -- Anemomaster is a middle and high temperature anemometer that simultaneously displays air velocity and temperature. Probe Model 0203 measures the middle temperature range up to 392º Farhenheit ( 200º Celsius) . Probe Model 0204 measures the high temperature range up to 932º Fahrenheit ( 500º Celsius) . The 0205 probe covers the same temperature range as the 0204 probe but with shorter probe length. The 6162 must be ordered with at least one probe. Only one probe can be used at one time.